Editor Don Webb notified me that Thicker Than Water has been selected as Editors' Choice for the Bewildering Stories First Quarterly Review of 2008 in the category Short Stories. 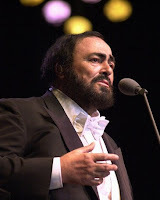 Don writes, "The Quarterly Reviews are 'the place to be' at Bewildering Stories. The Editors' Choices represent the recent best; they give newcomers a good place to start and veteran readers a way to catch up with anything they may have missed." It is an honor to have this piece recognized. The Wildish boys live on in the novel-in-progress (working under the same title) that I am hoping to finish sometime this summer. I see that Stevan Allred's The Painted Man was also selected in Serialized Works. Congratulations to Stevan! 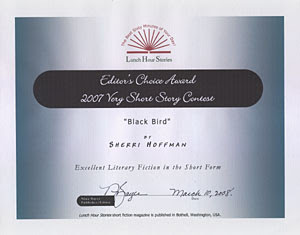 Nina Bayer, Editor of Lunch Hour Stories Magazine, wrote to inform me that my story Black Bird has been selected for the Editor's Choice Award in the 2007 VERY Short Story and Narrative Prose Poem Contest. I am pleased and honored to have this piece recognized. Final judge in the contest was Helen Sears; semi-final judges were Helena Bayer, Catherine Carter, Nancy Cluts, Ginger B. Collins, and K. Gordon Neufeld. The award makes Black Bird eligible for inclusion in the Lunch Hour Stories Anthology later this year. You can subscribe to Lunch Hour Stories (1 year/16 issues) for only $26! Go to www.lunchhourstories.com. Also the Lunch Hour Stories 2008 Short Story Contest is going on now!! Deadline is June 30, 2008.